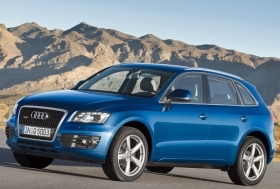 The Q5 is one of Audi's fastest-selling models. An extra allocation of 5,000 vehicles in the second half -- vehicles diverted from other markets around the world -- could push Audi's U.S. sales to a record 100,000 units this year. Audi is now due to receive 103,000 vehicles for the full year, said Audi of America President Johan de Nysschen in an interview. Audi obtained 48,000 units from Germany in the first half of the year, but de Nysschen says the brand has experienced a shortage in nearly every car line. Getting the additional vehicles doesn't automatically mean Audi will hit the 100,000 mark in 2010, he said. "We have to look at filling the pipeline and our anticipated sales projections for the first quarter of next year," de Nysschen said. "Our days supply is the lowest in the business." On July 1, Audi had a 21-day supply of vehicles in the U.S., the lowest in the industry. De Nysschen said that if Audi sales reach the 100,000 mark this year, it will cause a shortage of vehicles at the start of 2011. Currently, the Q5 and Q7 crossovers are the fastest-selling U.S. models -- usually gone 15 days after arriving at a dealership, de Nysschen said. Last year, Audi sold 82,716 vehicles in the United States. Sales through June were up 28 percent to 48,440 vehicles. The brand's U.S. sales peaked in 2007 at 93,506 units. Meanwhile, de Nysschen said, Audi has begun repositioning itself in the big sedan segments as it tries to take the brand further upscale. Peter Schwarzenbauer, Audi AG board member for sales and marketing, said he expects the A8, A6 and forthcoming A7 five-door sedan to account for 30 percent of U.S. sales within six or seven years, up from the current 15 percent. Worldwide, those segments represent 25 percent of Audi sales. Three new cars are expected to fuel the growth in premium sales. The redesigned long-wheelbase A8 sedan, which accounts for 80 percent of A8 sales in the United States, will debut in November. It will be followed by the A7 next year and a redesigned A6 sedan in 2011. De Nysschen said the three new vehicles will give Audi "a more aggressive upward positioning of the brand."